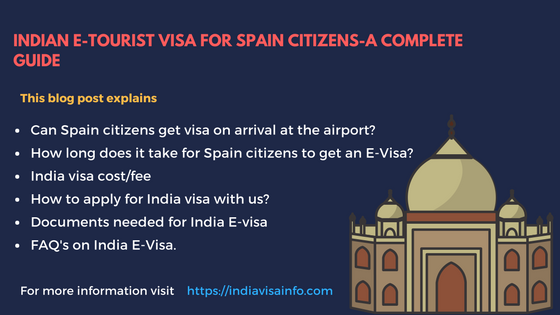 India finally has made her visa process simple or at least tried to.T his guide will help you in understanding how you can get Indian E-Tourist visa for Spain citizens. Although this guide is written keeping Spanish in mind, the process of acquiring a visa is the same regardless of your citizenship (Unless you are from Pakistan ). The Spanish have so far processed 45,000 Indian E-Tourist visas since 2015. Lately, the Indian government introduced ETVs (Electronic Travel Visas) with the intention of liberalizing the visa process to attract more tourists to India. Not to mention this step has proved to be very much effective, it can be seen from the report of the Bureau of immigration. As per the reports around 23,000 Spanish citizens visited Indian in 2016 which is way higher than the previous years. We had 17,000 happy customers in the last year. Can Spanish citizens avail Visa on arrival at the airport? No, It is not possible for foreign nationals visiting India to avail visa on arrival. The visa on arrival system was replaced with ETVs (Electronic Travel Visas) in 2015. Applying for ETVs has to be done online which takes around 4 days. Furthermore, forget arriving in India, You will not be permitted to board your flight to India without showing the airlines a valid visa. What is the difference between ETVs and a tourist visa? ETV stands for (Electronic Tourist Visa), this visa can be applied online unlike the other visa application processes where you have to personally go submit an application at the concerned Indian embassy. ETVs are valid for 60 days with double entry benefits. Tourists visas are for those who want to stay in India for a longer period, it allows tourists to stay in India for a period of 6 months with multiple entry benefits. How long does it take to get E-Tourist visa for Spanish Citizens? It usually takes around two to four days to get your E-Tourist visa approved. The background verification done by the officers from the concerned departments of the Indian government takes some time. If at any stage the officers are not satisfied with your application or the documents you submitted, you will be asked to submit additional documents. Be patient once you have submitted your request. E-visa must be applied 4 days before you travel to India. We recommend at least 10 days to avoid the last minute confusions. How long is my Indian Electronic Travel visa (ETV) valid for? Indian E-Tourist visa has a validity of 60 days. The validity begins from the day you arrive in India. After you arrive in India the immigration officer stamps your visa and will write down the validity of your visa on your passport. However foreign nationals who require visas with longer validity can apply for Tourist visas or Sticker visas which are valid for 6 months and 10 years respectively. How many times can I enter India with a single Indian E-visa? E-Tourist visa and E-Business visas are double entry visa, while E-Medical visa is valid for three entries. The visas are non-extendable and non-convertible. It costs €41 for Spanish citizens for Indian E-Tourist visa. However, credit card companies charge 2.5% on this amount as their service charge. We charge $25 If you would like to use our service. What all documents are needed to apply for India E-Tourist visa for Spanish citizens? You should keep the details of your parent’s passport and your work-related information handy. Your parents or grandparents were NOT born nor have lived in Pakistan. If they are, even if you’re a citizen of the aforementioned eligible countries, you are ineligible to get an online Indian Visa or E-Visa. You will have to apply for a regular Visa at one of the Indian Mission. How easy is it to apply for India E-Visa for Spanish citizens? Introduction of ETVs was supposed to make applying for Indian E-Visas a lot easier but unfortunately, the claims of it becoming easier still remains on paper. The website is so unreliable that you can expect it to crash anytime when you are filling in the application form. The most irritating one being the site crashing when you finish the entire application and click submit. You need to be lucky to be able to finish the entire application form and generate an application ID at the first try. If you were lucky enough to finish part one application form, get ready for round 2 with the payment portal. The banks cannot accept online payments without any hassle because of the lack of facilities. The major issue with the payment portal is that you get only 3 chances to make a successful payment. Click to know more about the issues with payment portal. If you want to avail the hassle-free service we provide you just have to fill in the below form and our dedicated visa processing team will take it from here. We will indeed make sure that you get your Indian visa without any hindrance. We give you a 50% discount if you only want us to make a payment against your visa application. We will charge only $25 for this service. How many times can I apply for E-Tourist visa in a year as a Spanish citizen? There is a limit on the number of times you can apply for E-Tourist visa, you can avail an E-Visa a maximum of two times in a calendar year (January to December). However for visas with longer validity and multiple entry benefits you can apply for a sticker visa at the concerned Indian embassy. Application for sticker visas cannot be made online you need to fix an appointment with the Indian embassy online before you apply. If you do not stay at the transit airport for more than 6 hours you should apply for the last airport in India. It is in this one that you will pass immigration and will have to present the document. For medical tourists, separate immigration desks and help centers are arranged at Delhi, Mumbai, Kolkata, Chennai, Bangalore, and Hyderabad airports. We will make sure that you get your E-Visa as early as possible, however, it will take at most 2 working days to procure your E-Visa. Our agents will contact to collect all the required information form you within 12 hours after you place an order. Get in touch with us at care@indiavisainfo.com or call us at +919632751222 anytime to get help with your application. Thank you for sending us the visa. Your services are really fast. Will do you use your services in future too. However it is good to purchase the visa from official website but it is better than that to go with this website as they provide hasslefree services to get the visa. This website is really useful. Authentic website for Indian tourist visa. I received my visa within 4 days. The backend support of this website is really amazing. I do recommend this to everyone. Thank you for the visa. It was really fast approval in my case. Anyway it was really useful for me. Thank you again. It was my first ever International trip which was to India. And thank you so much for taking care of all my visas from my family. You just made me amazed. Thank you for being trust full. Really good website for Indian visa. Thank you guys for being a supportive hand until I get my Indian visa. You guys were really helpful. I am so thankful for the assistance that you provided. Really nice to having nice experience from your website. we planned to visit South India and also some remote places in India. Anyway now we are happy that we have received our visas. Thank you so much for making it faster. Thank you so much for the visa. It was a nice experience for me. Really trust full website. I recommend the services of this website to my comment viewers. Quick solutions for Indian visa services is here. I received my multiple entry visa from this website within 3 days itself. The responsible customer support people really helped me in clearing my doubts about the visa. Thank you for all the team.